I operate my own digital recording facility which gives me the ability to provide audio in any format -- WAV, MP3, AIFF, etc. I can deliver the files via e-mail or FTP, or on CD, DAT or Zip Disk. With my own studio, I can offer fast turnaround -- in some cases just a few hours. Just fax or e-mail a script, and I'll e-mail the audio right back to you. 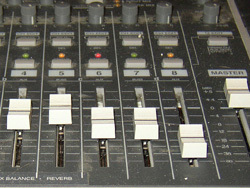 The studio is equipped with a Roland VS-880 digital multi-track, Edirol UA-5 audio card, Electro-Voice RE-20 mic and a Symetrix 528 voice processor, which adds up to clean, crisp, broadcast-quality audio.